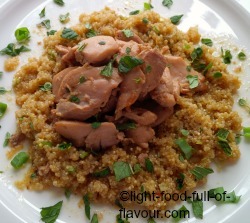 I absolutely love this ginger and soy chicken dish of mine - it is incredibly tasty. In an effort to make it as healthy as possible I am frying the chicken for as short time as possible before adding stock. I don’t want to be a spoilsport but, frying is one of the un-healthiest ways of cooking food as this produces free oxidising radicals which can destroy cells and increase the risk of cancer, heart disease and premature ageing. The longer you fry the food at a high temperature, and the more burnt the food is, the higher the risk is. The healthiest fat to use for frying is coconut oil, olive oil and butter – in that order. I use coconut oil for all types of Asian-style dishes as I think that the taste of coconut enhances this type of food. For other types of food I tend to mostly use olive or rapeseed oil. I’m either serving this ginger and soy chicken with herb and citrus quinoa, roasted tomatoes and some kind of green vegetables, or I skip the quinoa and simply add sliced sugar snaps and spring onions (scallions) to the broth during the last minute of cooking. I cook the quinoa in vegetable stock to which I add the juice of a lemon or lime – 2 parts stock to 1 part quinoa – for 15 minutes. 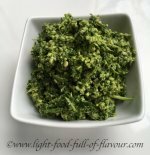 Once the quinoa is cooked, I add sliced spring onion (scallion) and herbs such as lemon thyme, mint and parsley. You could serve the broth with cooked noodles as well. Gluten-free soba noodles are both tasty and healthy. Whichever way you choose to serve it, hand out a spoon as well as the broth is simply divine. 1. In a glass or ceramic bowl, mix together all the ingredients for the marinade. Add the chicken pieces and mix well. Cover the bowl and leave the chicken to marinate in the fridge for at least 30 minutes – preferably longer. 2. Add some coconut oil to a large frying pan and fry the chicken pieces in batches - sprinkling some salt over each batch - over a medium-high heat for about a minute (don’t over-crowd the pan). Remove each batch and leave to the side. 3. Once you have fried all the chicken, add some of the stock to the frying pan to de-glaze the pan and add this to a medium-sized pot or casserole dish. Add the rest of the stock, all the chicken and any marinade left in the bowl that you marinated the chicken in. Bring to a boil, then reduce the heat and simmer for about 10-12 minutes. Check the seasoning. This can easily be done well in advance – the flavours of this ginger and soy chicken dish will intensify when left to stand – leaving you plenty of time to prepare whatever else you’d like to serve this dish with.